The Cancun agreement set up a “Green Climate Fund” to administer assistance to poor nations suffering from floods and drought due to global warming. The European Union, Japan and the United States have led pledges of $100 billion per year for poor nations up to 2020, plus $30 billion in immediate assistance. The agreement says it “recognizes that deep cuts in global greenhouse gas emissions are required according to science” and calls for “urgent action” to cap temperature rises. But this chart gives lie to such claims. 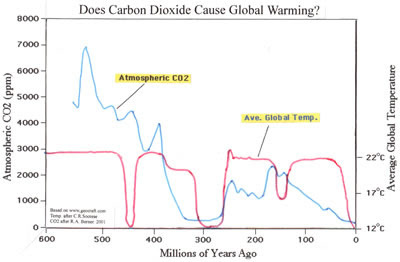 You can clearly see that on a multimillion-year scale global temperatures have been confined to a steady band unrelated to even huge changes in atmospheric carbon dioxide. The window of opportunity that is going to close is not a scientific one but a political one—because more and more people are realizing that global warming alarmism is based on phony science and outright lies. Foremost in the struggle to bring essential scientific truths to light on this issue is the Nongovernmental International Panel on Climate Change (NIPCC) founded and directed by the distinguished atmospheric physicist S. Fred Singer. With assistance from climate experts in 16 countries—who donated their time and efforts—the NIPCC produced a massive, extensively-illustrated 880-page report “out of concern that the IPCC was provoking irrational fear of anthropogenic global warming,” in the words of Dr. Singer. The report references 4,000 (!) research papers in peer-reviewed scientific journals that contradict IPCC conclusions but were not used by the IPCC though it claims to be the definitive source of climate research. The entire report can be downloaded free from the Heartland Institute website. The disclosure of thousands of emails from climate scientists in November 2009 became known as the “climategate” scandal. It raised concerns about the validity of global warming predictions and the integrity and professional misconduct of some of the world's leading climate scientists. But even before “climategate,” some important scientists tried to alert the public to the unscientific nature of IPCC procedures and conclusions. These scientists were generally derided as “deniers” by the news media and opinion makers. The IPCC regularly submits its reports to its Expert Reviewers Panel. As you might expect, most of its appointments to this panel have been supporters of global warming. A few nonbelievers have been included to give the appearance of balance, but their comments and questions have been routinely ignored as the IPCC focuses on what it claims to be the “consensus” view. Over the period I have made an intensive study of the data and procedures used by IPCC contributors throughout their whole study range....Right from the beginning I have had difficulty with this procedure. Penetrating questions often ended without any answer. Comments on the IPCC drafts were rejected without explanation, and attempts to pursue the matter were frustrated indefinitely. Over the years, as I have learned more about the data and procedures of the IPCC I have found increasing opposition by them to providing explanations, until I have been forced to the conclusion that for significant parts of the work of the IPCC, the data collection and scientific methods employed are unsound. Resistance to all efforts to try and discuss or rectify these problems has convinced me that normal scientific procedures are not only rejected by the IPCC, but that this practice is endemic, and was part of the organization from the very beginning. I therefore consider that the IPCC is fundamentally corrupt. The only "reform" I could envisage, would be its abolition. [The] flagship set of data promoted by the IPCC are the figures showing the increase in atmospheric concentration of carbon dioxide. They have manipulated the data in such a way to persuade us (including most scientists) that this concentration is constant throughout the atmosphere. The models are so full of inaccurately known parameters and equations that it is comparatively easy to "fudge" an approximate fit to the few climate sequences that might respond. This sort of evidence is the main feature of most of the current promotional lectures. Yes, we have to face it. The whole process is a swindle. The IPCC from the beginning was given the license to use whatever methods would be necessary to provide "evidence" that carbon dioxide increases are harming the climate, even if this involves manipulation of dubious data and using peoples' opinions instead of science to "prove" their case. The disappearance of the IPCC in disgrace is not only desirable but inevitable....Sooner or later all of us will come to realize that this organization, and the thinking behind it, is phony. Unfortunately severe economic damage is likely to be done by its influence before that happens. For more extensive coverage of global warming, see my three-part article “Global Warming, Global Myth” at here . For some surprising facts out the Copenhagen Climate Summit, see my article “Copenhagen Climate Summit: Hidden Agenda” at here . Below is a picture of a CFL light bulb from my bathroom. I turned it on the other day and then smelled smoke after a few minutes. Four inch flames were spewing out of the side of the ballast like a blow torch! I immediately turned off the lights. But I'm sure it would have caused a fire if I was not right there. Imagine if the kids had left the lights on as usual when they were not in the room. I took the bulb to the Fire Department to report the incident. The Fireman wasn't at all surprised and said that it was not an uncommon occurrence. Apparently, sometimes when the bulb burns out there is a chance that the ballast can start a fire. He told me that the Fire Marshall had issued reports about the dangers of these bulbs. Upon doing some Internet research, it seems that bulbs made by “Globe” in China seem to have the lion's share of problems. Lots of fires have been blamed on misuse of CFL bulbs, like using them in recessed lighting, pot lights, dimmers or in track lighting. Mine was installed in a normal light socket. I bought these at Wal-Mart. I will be removing all the Globe bulbs from my house. Wal-Mart alone has over 4,300 stores in the U.S. and 4,100 in 14 other countries. It claims 176 million people visit its stores every week. So they must have sold thousands—maybe tens of thousands—of these problem bulbs already. Note, too, that while the article says Globe is the manufacturer of the lion's share of the problem bulbs, the problem evidently occurs with other manufacturer, too, though maybe not as much. Here's another type of problem. Recently I was in a local Ace Hardware store to buy some paint. When I went to the checkout counter with it, there was an elderly gentleman ahead of me who wanted a refund or replacement for a CFL that wasn't working properly. The woman behind the counter said this was her first day on the job and she didn't know how to handle a refund or replacement and would have to get the manager, who was in the back of the store. I asked him if he had come to the store solely to return that CFL or if he had other shopping to do. He said he made the trip solely to return the bulb. I've never heard of such trips occurring because of incandescent bulbs, but the cost of the driving and inconvenience of such trips is never included in the claims of all the money you save by buying CFLs. Since the man had no other reason for his trip, the entire cost should have been charged to his cost for CFLs, but he told me he that, even though he had a bad experience, “everyone knows these bulbs save you a lot of money.” I told him the claims of big savings from CFLs were not true, that there were other problems, too, such as false claims about how long they last, damage from ultraviolet light to plastics, fabrics, pictures, and furniture finishes, plus environmental costs and disposal problems. I said if he had a computer, I would tell him were he could read my article on my blog (link) explaining these things. He said he didn't have a computer and never intended to get one. Finally, there is the news from Germany that consumer protection organizations have demanded suspension of the European Union ban on incandescent light bulbs, citing official tests of danger from CFLs if broken. According to test results released Thursday, December 2, by the Federal Environment Agency (UBA), the mercury levels from broken CFLs are twenty times higher than regulations allow in the surrounding air for five hours after breakage. Jochen Flasbarth, President of UBA, said the phase-out should occur “with safer products that have no avoidable health risks” and called the mercury danger “the Achilles heel” of the energy saving bulbs. Yet the U.S. government claims they are safe and promotes them, trying to show it is better at deciding what is good for people than their own choices in the marketplace. “It can't be that the state bans a safe product and replaces it with a dangerous one,” said Gerd Billen, the leader of the Federation of German Consumer Organizations (VZVB). In September the European Union began phasing out incandescent bulbs. The complete phase-out is to occur by 2012. POSTSCRIPT: On December 13, one week after posting this blog, I received an email from a man who had installed CFLs in his home about a year ago in order to save money from their much-ballyhooed long lives. Three of them had already failed far short of their advertised life expectancy. And on one of them the base had melted and showed evidence of charring. Also, three other points should be made about John Brazell's experience above. 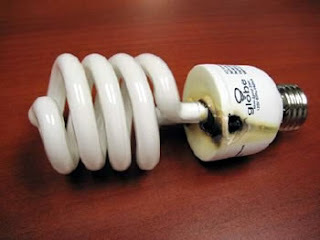 First, notice that breakage of CFLs can occur for a reason other than dropping them; thus dropping them isn't the only way the dangerous mercury can be released. Second, it is likely that whoever cleaned up the broken CFL in the motel was unaware of the proper cleanup procedure and thus did not follow it. If that person vacuumed up the broken glass, the vacuum would have been contaminated, as demonstrated by extensive testing by the Maine Department of Environmental Protection. Therefore, if the vacuum was then used in other motel rooms, it would have created a health hazard to future occupants of all those rooms for many weeks, perhaps even longer. The MDEP found there was no practical way to decontaminate a vacuum cleaner, and the pollution it would emit into a room from subsequent use could be hundreds of times—sometimes thousands of times—greater than the allowable safety limit. (See link.) Third, we don't know how the broken bulb in this instance was disposed of, but many jurisdictions prohibit discarding broken or burned out CFLs in regular trash, requiring instead they be taken to a toxic waste site. They do this to prevent the danger of mercury pollution of land and ground water. Since only about 25 percent of broken or used CFLS are disposed of properly, there is a good chance the CFL in this case was disposed of in an environmentally unsafe manner. And the person responsible would have been breaking the law. President Obama has failed to learn the simple basic lesson that the Pilgrims, who established the tradition of Thanksgiving Day in 1623 (not 1621, as often claimed), learned the hard way. The bounteous harvest they were gratefully celebrating on that day was preceded by years of starvation. They arrived in mid-December 1620, and half of them died the first year. Though the Indians helped them survive, the colonists were chronically short of food, and their numbers continued to dwindle. Under the Mayflower Compact, which governed the colony, “all profits and benefits that are got by trade, working, fishing or any other means” were community property in the “common stock” of the colony. And “all such persons as are of this colony are to have their meat, drink, apparel and all provisions out of this common stock.” People were required to put in everything they could—they were forbidden from growing their own food—and to take out only what they needed. It was a policy of “from each according to his ability, to each according to his need,” centuries before Karl Marx seduced millions of people with those words. Under the circumstances, there was little incentive to produce food. Severe whippings were tried to induce greater production, but they did little more than increase discontent. The social disharmony, along with the food shortages, disappeared once the concept of private property was introduced and people could keep whatever they produced, or trade it away as they saw fit. In 1647 Bradford was able to write “any general want or famine hath not been amongst them since to this day.” Such was the success of the new system that in 1624 the colonists began to export corn, trading it for beaver pelts, other furs, and meat. Jamestown, the first permanent English colony in America, established in Virginia in 1607, had an experience similar to the Pilgrims at Plymouth. Early years of starvation were followed by converting to a system of property rights and a free market, which brought abundance. Under collectivism, less than half of every shipload of settlers survived the first twelve months at Jamestown. Most of the work was done by only one-fifth of the men, to whom the socialist system gave the same rations as to the others. During the winter 1609-10, called “The Starving Time,” the population fell from 500 to 60. There is no shortage of people who want a political system that gives them the fruits of other men's labors, as at Plymouth and Jamestown. And there is an abundance of politicians willing to accommodate them at the expense of other men's property. The result is repetition of the collectivist systems (socialism, fascism) that have failed in the past, and no end to the discontent and resentment they engender. But people can be seduced to try them again and again by lofty idealistic statements, eloquent messages of hope, and promises that can never be kept. All of which allow the covetousness of other people's property—whether for personal gain or altruistic, collectivist aims—to masquerade under noble-sounding phrases. When Barrack Obama was campaigning for the presidency, he promised to redistribute other people's wealth for the collective good. In a short but spirited dialog with a small businessman, “Joe the plumber,” Obama argued that society would be better off if Joe's taxes were increased and the money distributed more widely to those less well off. What is this but a denial of Joe's property right to his own money and a repetition of the socialist distribution schemes that were so disastrous at Plymouth and Jamestown? Once he was president, Obama came up with a health plan that would require everyone to buy health insurance—as though people's money was not theirs by right but, rather, was part of the “common stock” of community property, to be allocated by the leader for the collective good! And, just as at Plymouth, people who did not cooperate would be punished—not by severe whippings as was done there, but by the more civilized penalty of seizing their property (money) through fines if they refused to buy health insurance. Contrast the government inflicting pain and penalty to force compliance compared to the benefit and satisfaction—even happiness—from market transactions, which people undertake without force or penalty in order to enhance their lives and are far more effective than socialistic distributions. Obama said, "We are fundamentally transforming the United States of America." He is indeed, wiping out the fundamental principles that allowed America to prosper. Obama claimed, "This is our moment, this is our time to turn the page on the policies of the past, to offer a new direction." Yes, he is “turning the page on the policies” of property rights and free markets. But the direction he is offering is not new but old. It is the ancient system of four centuries ago, before property rights, those basic rights which are still denied in varying degrees in many countries that have never discovered free-market capitalism, much less embraced it—and whose standard of living reflects that fact. And those countries comprise a large share of the 89 percent of the world's people who do not think capitalism is a good thing—but who look with envy on America's success and demand we redistribute a share of our wealth to them. "Generations from now,” Obama said, “we will be able to look back and tell our children that this was our time." Yes, and they will be the worse for it—and damn you for it! China was a poor country for a very long time, right up until it began to veer away from communism and introduce some capitalistic, free market reforms. In only a few short decades it has achieved tremendous economic growth, but the vast majority of its people still live in abject poverty. Yet today, the government admits that private citizens own more than 3,000 tons of gold—about three times the amount the central bank controls. Where did all this gold come from? Only a very small part was acquired in the recent years of economic growth. The rest was accumulated gradually and painstakingly over many centuries, under many different political regimes, by people who saw it not only as beautiful but as an enduring store of value. The story is much the same in India, where people for many centuries accumulated not only immense quantities of gold jewelry but silver jewelry as well. Farmers traditionally stash their savings in precious metals. Rural buyers usually account for 30-40% of gold purchases every year. India's majority Hindu population regard the Hindu festival of lights (Diwali) as an auspicious time to buy gold. This year the festival will be celebrated on November 5, but the festival season runs from September to late November, or even early December in some states. “Most of the crops would have been harvested by then and they [farmers] would be buying. Typically their reserve money goes into gold,” says Mr. T. Gnansekhar, director of Commtrenz Research. He says this year's bumper crops mean farmers will likely account for around half of the gold purchases of 400-450 tons in India this year. India is the second largest consumer of gold. For many years it held the number one spot, but in the past year it was surpassed by China. Indians traditionally favored gold jewelry, but now they are buying coins, bars and ETFs too. In the second quarter of 2010, India's demand for gold rose 38%, reaching $1.6 billion. On the other side of the planet, gold was valued by native Americans, especially in Central America, Peru and Columbia. The desire for gold was what prompted the Spanish crown to finance Columbus' voyage with instructions to “Get gold, humanely if possible, but at all costs, get gold.” Reports of profusion of gold ornaments among natives fueled the exploration and conquest of the Aztecs and the Incas by Cortes and Pizzaro. In some cultures, private gold currencies served as the medium of exchange long before kings and governments got into the act of forcing the populace to accept fiat paper instead. The rulers never comprehended the damage created by their money illusion, which always impoverished the people and devastated the economy. It's happening again today. In the past, after the damage was done, the people learned the hard lesson and would no longer accept unbacked paper money. Either their government would then turn to a gold-backed currency—as the U.S. did after the Revolutionary War—or some other country would, becoming the dominant monetary power and leading other nations back to gold. For example, in 1252 A.D., after a long period of monetary disarray, the city-state of Florence reintroduced gold coins, florins. Genoa quickly followed, perhaps in the same year. In 1254 Louis IX of France commenced gold coinage. Some thirty years later Venice joined in. In 1328 Germany began minting the Bavarian, which closely imitated the florin. One by one, these and other countries turned to gold when they realized the monetary stability it provided was beneficial to trade and prosperity. It will happen again. The only question is when and how. The U.S. could return to gold now, while it still has the largest gold holding, with much less pain than after the smash-up occurs, but it won't. The politicians are not about to face up to the fact they have been wrong and have caused the problem. They like being well-paid “public servants” and playing god with the nation's economy and other people's lives and want to continue their (so-far) winning formula for staying in office: promise more benefits from more government spending, and pass more laws so “this will never happen again.” If 2,000-page laws don't work, they will pass 4,000, 8,000 or 20,000-page ones. It doesn't matter. Practically nobody in Congress reads them anyway. And certainly not the president. They couldn't even if they wanted to; the laws are simply too voluminous. Reading them wouldn't do any good anyway because they don't have the answers. All that matters to the politicians is that the laws can be held up to the public as proof the administration is “doing something” about the problems and keeping the benefits coming in return for the public keeping the votes coming. Thus things will probably have to get much worse before the public wakes up, by which time the pain and cost will be much greater. No one knows when that will happen. But it could happen suddenly, like when a small leak develops in a dike, then erosion gradually increases the flow—and then suddenly the whole structure gives way and a flood ensues. Confidence in the U.S. dollar has been eroding, and the international monetary structure has been greatly weakened. No one knows when the end will come and the flood of dollars will flow into gold, but those with gold are far more likely to emerge better off than those without it. And more and more people are realizing this. While Americans are preoccupied with paper (laws, regulations, fiat paper money), China has quietly become the world's largest producer of gold as well as the largest consumer. And as its people become more affluent, their appetite for buying gold is increasing. Their opportunities for doing so are also increasing through a new Chinese gold futures exchange, ETFs and even online gold sales. The government, which used to restrict how much gold citizens could own, now encourages gold buying. It runs ads on state television encouraging the rapidly growing middle class to own gold. In the second quarter of 2010, China's demand for gold jumped 187%, to $1.4 billion, second only to India's $1.6 billion. China's goal to have its central bank accumulate 10,000 metric tons of gold in ten years may seem ambitious, but let's try to put this in perspective. The 2,000 tons owned by the ETFs are worth about $83 billion as of this month. So 10,000 tons should be worth five times that, or $415 billion. But China already has about 1,000 tons, meaning it needs 9,000 to reach its goal. So we subtract $41.5 (half of the $83 billion for 2,000 tons) from $415 billion, leaving $373.5 billion for the remaining 9,000. Of course, as we noted earlier in this series, China is well aware that if it started buying aggressively, it would drive up the price; it certainly could not buy 9,000 tons for $374 billion. But China has $2.45 trillion! If China paid $450 billion for 9,000 tons of gold, it would still have over $2 trillion dollars left, still by far the largest hoard of dollars on the planet. Realistically, it would have to pay far more than $450 billion—which it could well afford to do—if that amount of gold were available. But the world's annual production of gold is only about 2,400 tons. If the central banks are unwilling to sell, where is all the gold China would like to buy going to come from? The IMF does not have enough gold to alter the long-term scenario on more than a temporary basis, even if it decided to sell its entire stock. It is not going to do that since it is unlikely to take an action that would all but guarantee its future existence would be irrelevant. Besides, any sales would have to be approved by the member nations, which is not going to happen. China could certainly afford to pay a much higher price for gold—certainly much higher than in our example—but no one can say what that might be or how high the price of future available supplies might be. At the same time, however, the value of her remaining dollars would decline drastically, and no one can say how low it might go. China is understandably leery of the outcome of such a trade-off. It would prefer to add to its gold holdings incrementally or off-market without stimulating a buying frenzy in the markets and hope that the dollar does not suffer a sharp fall from U.S. deficits and inflation in the meantime. China would love to buy gold from the IMF because this is gold that would not be traded in the market, but there are other ways, too, of acquiring off-market gold. China has the world's sixth largest gold mine reserves and is rapidly developing new mines and expanding exploration. Domestic production provides a way for the government to buy gold directly that never reaches the world markets. This year China initiated another way to increase its gold holdings without going into the open market. The state-controlled China National Gold Group Corp., the nation's largest gold company, recently signed a long-term contract to buy gold concentrates from the large Kensington Mine in Alaska. Even if China acts with restraint on purchasing gold in the open market, worldwide demand for gold is increasing from other sources, as we have pointed out. At some point the flow of money into gold may become a flood that leads China to join the crowd and buy before worldwide demand pushes the price even higher. Meanwhile, the value of China's dollar assets in U.S. treasuries will be declining from Obama's deficit budgets and the Federal Reserve's easy money policies. These will further increase the incentive for China to unload U.S. treasuries. The Chinese government has been extremely patient about giving Obama a chance to demonstrate that his spending policies will stimulate the economy and end the recession. But eventually it will be obvious to everyone that those policies are not working and, in fact, have made the problem worse. Now, three years after the collapse of the housing/mortgage market, the prospects there are worse than ever. Last month 102,000 homes were foreclosed, the highest total ever. And the owners of 11 million homes owe more than their homes are worth. This problem is not going away and is going to put further strains on the economy and the dollar. Allan Greenspan made two important points in two very recent interviews: 1) housing prices are right on the edge where a further price decline will create a new huge wave of foreclosures, and 2) interest rates are going to go up substantially as the U.S. need to borrow is bumping up against the limit at which buyers are willing to purchase U.S. treasury securities. As interest rates go up, the value of government bonds goes down. So China will see the value of its massive investment in U.S. treasuries decreasing at a time when the price of gold is increasing, giving further argument for unloading some of its treasuries and further reason not to buy more of them. Remember, too, that China's favorable trade balance, which accounts for its massive $2.45 trillion dollars, is almost certain to continue growing. That country is going to have even more dollars to invest as gold looks more attractive and U.S. treasuries look increasingly unattractive. In the end, gold will win over fiat paper. It always has. Postscript: When I began writing this series, China's held $2.4 trillion in foreign exchange reserves. As I was writing, new figures showed it rose to $2.45 trillion, so I made the revision in my writing. Now the People's Bank of China has made data available for the third quarter 2010. The central bank's stash of dollars jumped by $194 billion in the third quarter, resulting in a total of $2.648 trillion as of September 30. And there is every reason to believe this trend is going to continue. Private investors have been seeking a store of value in the same way as the nations' central banks. Alarmed by Greece's monetary problems, Europeans have led an exodus out of the euro and into gold coins, bars and exchanged-traded gold funds (ETFs). In scarcely two weeks in May 2010, the Austrian mint sold 243,500 ounces of gold, compared to 205,000 for the entire first quarter. Adrian Ash, head of research at Bullion Vault, an online gold trading service, said, “We saw very strong flows of money from European customers,” a demand he attributed to “anxiety over the euro.” In May, 39% of Bullion Vault's new customers came from the euro zone, compared to an average of 21% since the start of 2009. The South African Mint increased Krugerrand production by 50% in May on brisk European demand. European concerns have spread to the U.S., as well as other countries. The U.S. Mint is running short of gold coins. Sales of American Eagle one-ounce gold coins tripled in May from the previous month. Sales of American Eagles totaled 449,000 ounces in 2005 but 922,500 by September 2010. Buffalo coins, which the U. S. Mint makes of pure gold, were sold out in September. Other gold coins such as Krugerrands have also been selling well in the U.S. and elsewhere. In addition to the above, the International Monetary Fund holds 2,966.8 metric tons and the European Central Bank 501.4 metric tons. You might easily assume these two institutions plus all the nations' central banks must control most of the world's gold. You'd be wrong. They control only 18% of the gold in human hands. Jewelry, with 51%, accounts for more above-ground gold than all other uses combined. Industrial use, mainly dental, biomedical, and electronic, accounts for 12%. That leaves about 17% taken up by investment. Overall, investment demand doubled in 2009. According to Gold Fields Mineral Services, this was the first time in three decades that investment demand exceeded jewelry demand. In 1998 investors accounted for less than 7% of demand. In 2009 they accounted for 39%. In the second quarter of 2010, they bought more than 50% of all gold sold. An extremely significant development is that buyers increasingly want to take possession of physical gold, whether they are dealing in the futures market or buying coins or bars from dealers. They are not buying and selling for paper profits. At the CME Group's Comex, the world's largest metals futures exchange, investors took delivery of 39% more gold so far this year compared to last year. The demand for storage facilities for gold coins and bars has led to a scramble for vault space by banks and private vault services. First State Depository Co. says it has increased storage capacity three times this year and is considering buying property next door so it can provide even more. Responding to increased demand, the World Gold Council in June announced a $9 million investment in Bullion Vault, the world's leading gold ownership service, which stores 21 tons of gold for 20,000 customers in vaults in Switzerland, London and New York. Vaulting firms Via Mat International of Switzerland and Ocasa of Argentina are expanding. J.P. Morgan Chase will open a new vault in Singapore, and Barclays Capital is seeking to expand its space in London. The shortage of secure storage for gold investors was compounded last November when the large British bank HSBC required small investors to take possession of their gold stored in the bank's 4.2 million-ounce storage facility in New York City. It said it needed the space to meet the demands of large institutional investors. This was upsetting not only to the small-account owners but to dealers who sent their customers to HSBC. Goldstar Trust Co., of Canyon, Texas, had been an HSBC customer for 15 years and was sending more than 1,000 new accounts each month to them. But HSBC no longer wanted their business because the big investors piling into gold were more lucrative. “We are receiving steady inquiries for storage from high-net-worth individuals,” said Barry Wainstein, global head of foreign exchange for Scotia Capital. Its precious metal division, Scotia Mocatta, has a 4.8 million-ounce storage facility in New York and has been expanding its vault in Toronto. Hedge fund manager John Paulson, whose fund made $3.7 billion by betting on the collapse of the subprime mortgage market, is now a big investor in gold. In a speech to the New York University Club in September 2010, he said 80% of his assets are in gold, spread between ETFs, physical bullion and shares in gold mining stocks. Billionaire George Soros has also become a big investor in gold. Since people do not accumulate great wealth by being stupid, maybe their current investments deserve our attention. Investors often choose geographic diversity in storing their gold. Countries such as Switzerland and Canada are seen as posing fewer geopolitical risks than most others, and their banking systems did not require the massive bailouts that accompanied banking failures in the U.S. Also, many U.S. citizens, remembering that Franklin Roosevelt confiscated most privately held gold in the 1930s, are leery of storing gold in regulated banks in the U.S., fearing such a policy might be repeated. They may also be leery of disclosure agreements between the U.S. and foreign governments regarding foreign banks, hence an interest in non-bank storage facilities even for legitimate holdings. Sprott Asset Management in Toronto recently added storage for about 250,000 ounces at the Canadian Mint. Owners of its ETF may redeem their shares at the mint and take possession of bullion. SPDR and other gold ETFs sold in the U.S. commonly store their gold in London, Zurich and in the U.S., but they do not allow shareholders to redeem their shares for bullion. Why is there so much interest in owning physical gold? Because it is a store of value. There is no longer any currency in the world that is a reliable store of value. As further evidence of this, look what has happened with the currency markets. Trading has become vastly larger, more volatile and riskier as people try to escape the effects of monetary instability and governments' efforts to manipulate currencies in the absence of a sound international monetary system. Currency trading volume is now $4 trillion per day, according to the Bank for International Settlements, which makes a survey every three years in April. By comparison, stock trading in the U.S. in April averaged $134 billion. Even the giant market in U.S. Treasuries averaged only $465 billion per day in April. Previous surveys by the BIS showed daily currency volumes of $3.3 trillion in 2007 and $1.9 trillion in 2004. There are now 44 currency ETFs, compared to only one in 2004. Globalization, of course, causes an increase in currency trading, but that in itself does not create instability. With reliable currencies of a gold-based international monetary system, currency trading would grow in an orderly manner as commerce expands, rather than from attempts to offset or profit from currency fluctuations with quick in-and-out trading. At the end of last year, according to Robert F. Wilmers, chairman and CEO of M&T Bank Corporation, the total outstanding debt of Fannie and Freddie “either held directly on their balance sheets or as guarantees on mortgage securities they'd sold to investors, was $8.1 trillion. That compares to $7.8 trillion in total marketable debt outstanding for the U.S. government.” And it's going to get worse, because the government has directed them to lose money by modifying mortgages to prevent foreclosures. The banks have already repaid $136 billion of the $205 billion they received, and GM, Chrysler and AIG are working to make repayments, but Fannie and Freddie are designed to lose more money going forward. The Congressional Budget Office estimates the taxpayers' cost of keeping Fannie and Freddie operating will be $380 billion over the next ten years. But this is based on an assumption that the housing market will “normalize” as the recession ends, which may very well be overly optimistic. The full cost of subsidizing mortgages remains hidden because it is off the official balance sheet, but the GSEs have already cost the taxpayers nearly $150 billion. When Treasury first bailed them out in September 2008, Congress put a limit of $200 billion ($100 billion each) on federal assistance. When that appeared insufficient, the limit was raised to $400 billion. Then on Christmas Eve 2009 the administration raised the limit...to infinity. No limit whatsoever, for the next three years. Christmas Eve was a time when the public and the media would give little attention to the matter, and something had to be done before December 31. Otherwise, congressional approval would be needed to raise the $400-billion limit. Without that approval, negative net worth for Fannie and Freddie would force them by law into receivership, which would wind them down. The administration was preparing for the possibility of Fannie and Freddie exceeding the CBO estimate of $380 and even the previous $400 billion limit, perhaps by a wide margin. Thus, despite the government's efforts to convince the public that it has handled the problems of Fannie and Freddie effectively, those two will continue to bleed red ink and erode confidence in the dollar. Last year, French President Nicolas Sarkozy joined Russia, China and other emerging countries in calling for an end to the dollar's reign as the primary international currency. And the United Nations Conference on Trade and Development endorsed moving away from the central role of the dollar in the world monetary system. The U.S. announcement in 1971 that it was ending the final link between gold and the dollar led to the collapse of the Bretton Woods system of fixed exchange rates in 1973. From 1976 to 1980 the International Monetary fund eliminated the use of gold as a common denominator, abolished the official price of gold, and ended the obligatory use of gold between the IMF and its member countries. Also, it sold approximately one-third (50 million ounces) of its gold holdings “following an agreement by its member countries to reduce the role of gold in the international monetary system,” says an IMF fact sheet. Naive social reformers and politicians have long dreamed they could create a better world if political power could overcome the restraint gold-anchored money imposed on their good intentions, because it prevents runaway government spending. But their dream to reduce, or even ultimately eliminate, gold from the international monetary system suffered a rude awakening by what has been happening to the dollar cut lose from gold. France, which had been the largest seller of gold, now says it will sell no more gold. A report by the Austrian central bank last year said the rise in gold prices and “the concomitant depreciation of the U.S. dollar over the past few years have shown clearly how important gold is as an instrument for a central bank.” Germany's Bundesbank, the world's second largest official holder of gold with 3,417 tons has indicated it is now more willing to hold and buy gold than to sell. Russia has been buying regularly, bought about 100 tons in the past year, and says it intends to continue buying and increasing the percentage of its reserves in gold. Ever since the IMF began selling its gold, that additional supply—or even the threat of it—has had a tendency to hold down the market price of gold. But the situation has now changed, because of demand. On September 18, 2009, the IMF approved the sale of 403 metric tons of gold (one-eighth of its holdings of 3,217 tons) to shore up its own finances and enable loans to poorer countries. The IMF sold 200 tons to India and the remainder to three smaller countries. China has by far the world's largest holding of dollars, $2.45 trillion. Spokesman Cheng Siwei said Beijing is dismayed by the Fed's recourse to easy credit. He said China fears U.S. printing of money will lead to inflation and a hard fall of the dollar, which would seriously reduce the value of China's holding. So it has been diversifying into other investments. At the end of May 2010, China had reduced its holdings of U.S. Treasuries to $867 billion, down from $900.2 billion the previous month and the record $939.9 billion in July 2009. It has been buying commodities such as copper, iron, aluminum, lead, zinc and oil. It has been buying euros, other currencies and bonds of other countries and the ECB. It has been buying companies, factories, banks, and real estate all over the world. In 2009, China increased its gold holding by 76%, to 1,054 tons. It would love to buy much more, but as Siwei said, “When we buy, the price goes up. We have to do it carefully so as not to stimulate the markets.” China's Assets Supervision and Administration has set a goal of accumulating 10,000 metric tons of gold in the next ten years. The chart below shows why China wants more gold. You can see that as of the end of last year, gold comprised only one and a half percent of its vast reserves. Notice, too, that India, Russia and Brazil, which are large countries with rapidly growing economies, also have very small percentages of their official reserves in gold. Countries which are running current-account surpluses and don't have their own domestic production are the most logical future buyers. We have already noted the gold purchases by the central banks of India and Russia. According to the IMF, among the countries with the largest dollar surpluses behind China and Russia are Malaysia, Singapore, Kuwait, Saudi Arabia and Venezuela. 2009 was the first year since 1987 that central banks bought more gold than they sold. There are likely to be no shortages of buyers for future sales. The federal guarantee on mortgages was also a major factor in the housing bubble. Fannie and Freddie don't make loans. They are forbidden from doing so. Instead they buy mortgages from banks, bundle them into securities, and resell these to investors. This “securitizing” of mortgages doesn't require them to hold a mortgage on its books any longer than it takes to package and resell it. Once a mortgage is off the books, the agency's capital is freed up to do the same thing all over again. Hence the potential for a credit bubble. Even though the mortgages were sold to other investors, Fannie and Freddie for a fee still guaranteed that payments would be made on the loans. So when the banks—who got into the business pioneered by Fannie and Freddie—divided the securitized mortgages and repackaged them in SIVs (structured investment vehicles) and CDOs (collateralized debt obligations), the mortgage payments were still federally guaranteed. This made them attractive even to foreign governments and investors who didn't really understand these highly complex investments. All that mattered was the implicit safety that they were backed by the U.S. government. It didn't matter, as the Financial Crisis Inquiry Commission later pointed out, that Fannie and Freddie were twice as leveraged as Bear Stearns, a global investment bank that was an early casualty of the financial crisis. Entirely separate from their function of buying mortgages from banks and reselling them with a federal guarantee, Fannie and Freddie also held mortgages and mortgage-backed securities for their own accounts. As of Febuary 2008, they each held a portfolio of more than $700 billion of these investments, which they could buy on the open market with borrowed money. Because of the federal guarantee, the GSEs were able to borrow (by issuing bonds) at very favorable rates. They made profits on the difference between their borrowing costs and the interest they received from the mortgages or mortgage-backed securities. Then they bought interest-rate swaps or other derivatives to ensure that the interest rate spread stayed positive. However, when interest rates fell, the derivatives declined sharply in value. For example, for the second quarter of 2010, Freddie Mac reported a loss of $4.7 billion with $3.8 billion of this coming from derivatives, due to low interest rates. Federal policies also helped inflate the housing bubble in other ways. For example, the ability to claim tax deductions from interest on mortgages distorted housing prices. Because the tax deduction rises with the size of the loan, there was an impetus toward higher-priced homes and larger mortgages. The deductions “began effectively subsidizing gambles on fluctuations in housing prices,” says Dennis J. Ventry, Jr., an acting law professor at the University of California, Davis. States with the biggest mortgage interest deductions were among those hardest hit by the collapse. California ranked first in deductions, Nevada third and Florida eighth. Another influential government factor was the Fed control of interest rates. Following the collapse of high-tech stocks (the “dot-com” bubble) in 2000, Alan Greenspan steadily brought interest rates down to 1 percent in June 2003 and kept them low for an extended period, fearing raising them too soon would be inflationary. This policy subsidized credit and stimulated home buying—and also home building in an already over-built industry—by helping to push the rates on long-term mortgages to the lowest levels since Freddie Mac began keeping track in the early 1970s. At the same time, it sent the banks looking for higher returns to mortgage bonds, which had not only attractive yields but the safety of AAA ratings and the government guarantee. On July 21, 2010 President Obama signed into law the most sweeping overhaul of the financial system since the Great Depression. At the signing of the bill, he claimed it provided “the strongest financial protection for consumers in the nation's history” and they would never again have to “foot the bill for Wall Street's mistakes.”[!] He said nothing about Fannie or Freddie. The 2,300 page law, which is longer than all previous financial regulations in U.S. history combined, doesn't cover them. It will require federal regulators to write hundreds of new—and costly—regulations that will apply only to banks and private financial institutions. Do you suppose omitting Fannie and Freddie from the new law had anything to do with the fact that as of 2008 they had almost 150 lobbyists and, according to Politico, spent almost $200 million on lobbying and campaign contributions in the previous decade? Federal Election Commission data shows the money went to 354 senators and congressman, with Senator Barrack Obama receiving the second most money, behind only Chris Dodd. As you may recall, Dodd was the Senate sponsor and a principal architect of the Dodd-Frank financial overhaul bill the President signed. The Center for Responsive Politics reports the peak year of Fannie and Freddie spending for lobbying was 2004, when it reached $26 million. Yet in an April 2010 address, President Obama stated his financial regulatory proposals were struggling in the Senate because “the financial industry and its powerful lobby have opposed modest safeguards against the kinds of reckless risks and bad practices that led to this very crisis.” That is a statement of either flagrant dishonesty or flagrant ignorance. I have written more extensively on the housing bubble in a 4-part essay “Mortgage Crisis, the Dollar and its Future” at link, which I recommend you read. But I have included some explanation of the housing debacle here because it relates to the unfolding situation of Greece's monetary crisis. It is far larger than the general public realizes, has not been “solved,” leaves the U.S. far more vulnerable to contagion from the Greek fallout, and has ramifications for the international monetary system in the future that few understand. The financial crisis began with Fannie Mae and Freddie Mac, the largest factors in housing and banking, which are among the most heavily regulated aspects of the economy. These agencies are where the credit expansion occurred that made them larger than the Federal Reserve—and even larger than the gross domestic product of Japan, the third-largest economy in the world. This credit bubble was not the product of free markets or capitalism but the antithesis. It was the product of federal laws, regulations, politics and malfeasance by regulatory agencies. The banks are regulated by four separate agencies: the Federal Reserve, the Federal Deposit Insurance Corporation, the Office of Thrift Supervision, and the Office of the Comptroller of the Currency. Fannie and Freddie are federally chartered “government sponsored enterprises” (GSEs) that were regulated primarily by the Office of Federal Housing Enterprise Oversight (OFHEO) until 2008 when it was merged with various other agencies into a new Federal Housing Finance Agency. Congress and the President have control of the GSE budgets and programs in every sense. They exempted them from state and local taxes, authorized them to sell mortgage-backed securities, provided them with unlimited guarantees on their mortgages and the ability to borrow at preferential rates. There never was a shortage of regulatory agencies or powers to regulate. Or special advantages. Fannie Mae was founded in 1938 in response to many homeowners losing their homes to foreclosure during the Great Depression. In 1968 the federal government converted Fannie Mae into a private shareholder corporation to remove its accounts from the balance sheet of the federal budget. This was a time of increased spending for Lyndon Johnson's Great Society and the Viet Nam war. So, like the Greek government in more recent times, the LBJ administration chose to hide the extent of its spending by simply removing a large expenditure from government accounting. In 1970 the government created Freddie Mac to supplement Fannie Mae. In 2003 Freddie Mac was fined $125 million by OFHEO for accounting irregularities, and in 2007 it was fined $50 million by the SEC for accounting fraud. In 2006, OFHEO discovered “a wide variety of unsafe and unsound practices” at Fannie Mae. Its report stated: “Fannie Mae's faults were not limited to violating accounting and corporate governance standards, but included excessive risk-taking and poor risk management as well.” Fannie Mae was fined $400 million and ordered to restate its earning from prior years by an estimated $11 billion. The Federal Housing Administration (FHA) is actually older than Fannie Mae, having been founded in 1934. It, too, was part of Franklin Roosevelt's New Deal effort to expand credit to home buyers in the depression and enhance his popularity with voters. While much smaller than Fannie and Freddie before the recent collapse of the mortgage bubble, it has since grown enormously. Yet John Berlau, a scholar at the Competitive Enterprise Institute, says it had significant involvement in the bubble: “The collapse of whole segments of the housing market can be traced to FHA-subsidized mortgage products.” FHA loans, he says, “have been at the center of some of the worst excesses of the housing boom, including mortgage fraud, loans made without income verification, and property 'flipping' with inflated appraisals.” Senator Susan Collins, who headed a 2001 Senate investigation, said, “The federal government has essentially subsidized much of this fraud.” FHA mortgages originally required down payment of 20 percent, but that was whittled down over the years to 3 percent. During the Carter administration, the Community Reinvestment Act of 1977 (CRA) purported to remedy “redlining”—racial discrimination by banks denying mortgages in black neighborhoods. The evidence for such discrimination was feeble and misleading. Most applicants were approved regardless of race, and the slightly higher rejection for minorities reflected their poorer credit history. But the banks were now required to open new branches in low-income areas and to have a certain percentage of their small-business loans and home mortgages located there. They were also prevented from opening new branches in other—untroubled—areas if they failed to maintain this ratio. Acorn and other community groups were informally deputized by then House Banking Chairman Henry Gonzalez to draft statutory language setting the law's affordable-housing mandates....The goal of the community groups was to force Fannie and Freddie to loosen their underwriting standards, in order to facilitate the purchase of loans made under CRA....Thus a provision was inserted into the law whereby Congress signaled to the GSEs that they should accept down payments of 5% or less, ignore impaired credit if the blot was over one year old, and otherwise loosen their lending guidelines. Initially, the affordable-housing mandate was set at 30 percent of single-family mortgages purchased by Fannie and Freddie. In 1995, Henry Cisneros, President Clinton's secretary of housing and urban development, directed Fannie and Freddie to buy the mortgages of low- and moderate-income borrowers amounting to 42 percent of their annual business volume. His successor Andrew Cuomo upped that to 50 percent and directed the GSEs to buy mortgages from borrowers with “very low income.” Banks ended up having to make more and more “subprime” loans and agreeing to dangerously lax underwriting standards—no down payment, no verification of income, interest-only payment plans, and weak credit history. By 2007, HUD's affordable housing regulations required 55 percent of all the GSE loans to be made to borrowers at or below the median income, with almost half of these required to be low-income borrowers. The credit bubble was now inflated to the bursting point. But when it burst, it was not government but the banks that took the blame. The virulently anti-business and anti-capitalist Obama was quick to decry the “fat-cat bankers on Wall Street,” the “greedy” and “irresponsible” lenders who pushed subprime mortgages on the poor and vulnerable who couldn't afford them and now were losing their homes. The Obama-adoring news media, still in love with him since the early days of the presidential campaign, flooded the public with stories about how the economic misery was due to businesses run amuck in the reckless pursuit of profit and the lack of regulation. What was needed, according to the politicians, commentators and opinion makers who dominated the media coverage was greater regulation “to prevent this from ever happening again.” The question of whether the problems had been caused by regulation in the first place never seemed to come up. Nor did the issue of whether the federal government should even be involved in the housing market. Republicans as well as Democrats overwhelmingly supported the idea that government should help the poor, the down-trodden to achieve the “American Dream” of owning a home. And they certainly did not want to incur the wrath of voters by being perceived as unsympathetic to the poor and against programs for their betterment. Rather, they wanted voters to see them as caring and compassionate—and be willing to vote for them. In 2002 President George W. Bush, having Republican control of both houses of Congress, signed the Single-Family Affordable Housing Tax Credit Act. This Renewing the American Dream program provided almost $2.4 billion in tax credits to investors and builders developing single-family housing in poor and distressed areas. In 2003 he signed the American Dream Downpayment Act, which provided $200 million per year 2004-2007 toward down payment and closing costs for home buyers. The idea that home ownership was a socially desirable goal that should be promoted by the government led to a vast, incredibly expensive, decades-long effort, but how effective was it? Home ownership in the U.S. peaked at 69 % at the top of the housing bubble and is now 67%. But there are at least 14 countries that have higher ownership rates than the U.S., including Hungary, Iceland, and Poland. In the European Union, where most countries don't offer tax breaks and subsidies like the U.S., home ownership was just shy of 75% in 2006, according to Eurostat. Homeownership in the U.S. increased by only 3.4 percentage points over the last 20 years, the period of the the U.S. government's greatest efforts to promote it. In the Netherlands and Italy, it increased by 12 percentage points between 1991 and 2008. Canadian banks weathered the international financial crisis much better than U.S. banks. Canada has nothing comparable to Fannie or Freddie or our Community Reinvestment Act. It does not have 30-year fixed-rate mortgages, and interest on mortgages is not tax deductible. Down payments of less than 20 percent require the mortgage holder to buy mortgage insurance. Canada's regulatory agency concerns itself with risk management and abstains from social and political objectives, such as affordable housing and diversity. Yet it has a home ownership rate of 68%, and the percentage of mortgage loans delinquent for more than 90 days is approximately one-tenth of the U.S. level. A comparison to the U.S. shows two very different housing finance systems, one much more political and riskier than the other, with no advantage to the U.S. system. For Part V of this series, click on this link.